All of our KidZone areas use the D6 Curriculum for their corresponding age levels. We believe this provides parents the best opportunity to partner with the church in Bible learning. Each child will learn the same theme/story at their level so families can discuss and learn together. KidZone Nursery is helping children develop their first formal impression of their Father God. Parents are encouraged to volunteer in the nursery and help us create a warm and loving first impression of church for our youngest learners. For those who like a calm place to nurse your infant during the service, we offer a quiet area to breastfeed. Please feel free to use the chairs in the nursery where you can relax and feed your baby. KidZone preschool is a fun and creative environment where kids get to learn about God’s love and truths in a hands on way. Sessions include a variety of elements: music, bible stories, crafts, active games, play and snack time. 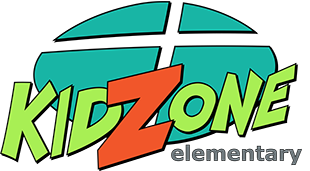 KidZone Elementary focuses on three teaching elements: Old Testament, New Testament and special topics (eg. grace, marriage, etc.) that help equip and instill Biblical truths and values into their lives as their leaders disciple and encourage them in their relationship with Jesus. Mornings include a creative large group time and a small group time with a consistent group of peers and leaders. Because children are very valuable to both God and us, all of our staff are screened for their suitability to work with children. Our volunteers have been referenced, interviewed and screened with a criminal history check (Lethbridge City Police), and an Investigation Record Check (Alberta Children’s Services). Our staff are also trained with our Plan to Protect policies on how to conduct themselves with children in our programs. Justine Dueck is our Children and Family Ministry Coordinator.